This post and story is part two of a three part story: Thinking about the Lost Arrow Spire (part one), preparing for the climb (this post), and doing the climb. Stay tuned for part three. The images posted here were shot with an Olympus XA (film) camera on cheap movie reversal film. A number of years ago I realized that the slides were in bad shape, so I had them professionally scanned. The original images weren’t great and years of dust and rough handling did them no good. But, they do help tell these stories so I use them without much cleanup. 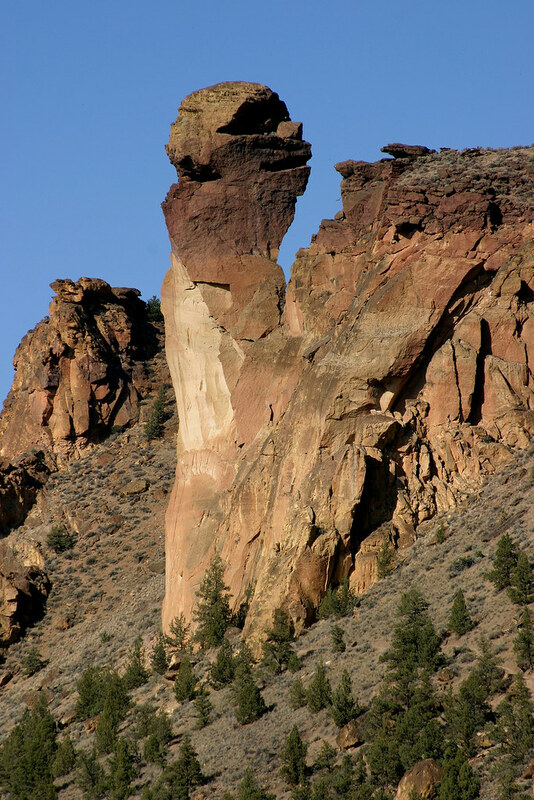 Doing a search on Flickr for “monkey face smith rock” or a Google image search will give you many more modern and clearer images although of course, not of our time there in the 1970’s. 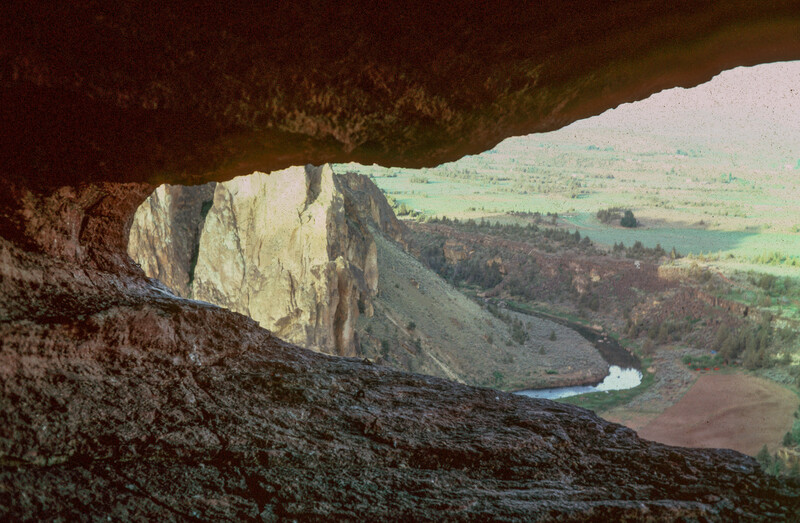 When Faye and I returned to Oregon from our 1977 Yosemite trip we had our sights set on a climb at Smith Rock, a climbing area on the other side of the Cascades in the high desert of central Oregon. We lived in Eugene, a good half day drive away (more if the VW bus was acting up). Smith was popular back then but it became a lot more popular after our friend and fellow climber, Allan Watts brought sport climbing techniques to the area (rappelling and placing bolts to allow harder free climbing without having to place protection). Many new difficult free routes were opened up and people started arriving from all over the world to do them. 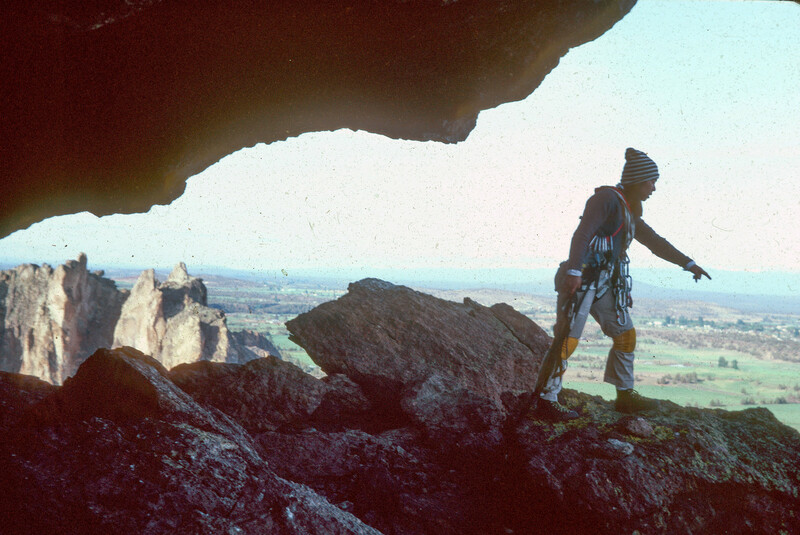 In the mid 1970’s Smith might have had only a few dozen climbers in the park on a weekend. In the 1990s and later things got a lot more crowded. Because we were trying to prepare for a steep aid climb on the Lost Arrow Spire, we figured we needed a steep aid climb that would help us get faster at rope handling, placing marginal protection, hanging belays, and doing aid on an overhang. Both of us had done the Pioneer Route and West Face Variation on Monkey Face so we were familiar with the tower but the West Face Route was longer, involved at least one hanging belay and at that point in time was done almost completely by aid climbing. 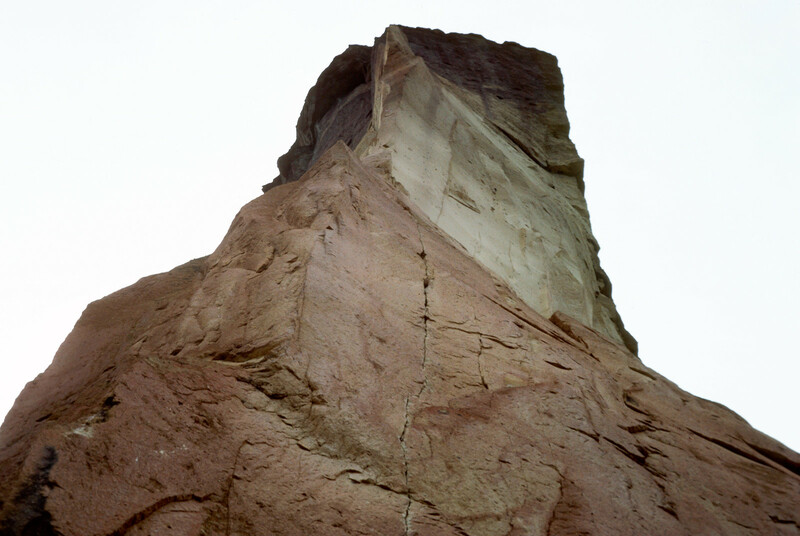 It had been put up (climbed first) in 1962 by Dean Caldwell, Byron Babcock, and Bill Lentsch. They followed the initial crack and put the expansion bolts in on pitch two and in the back of the monkey’s head to the top. Neither of us had done the route before and the route traversed the back of the monkey’s head which is a large cave with a relatively flat floor so we decided to plan a bivouac there to add to the fun. 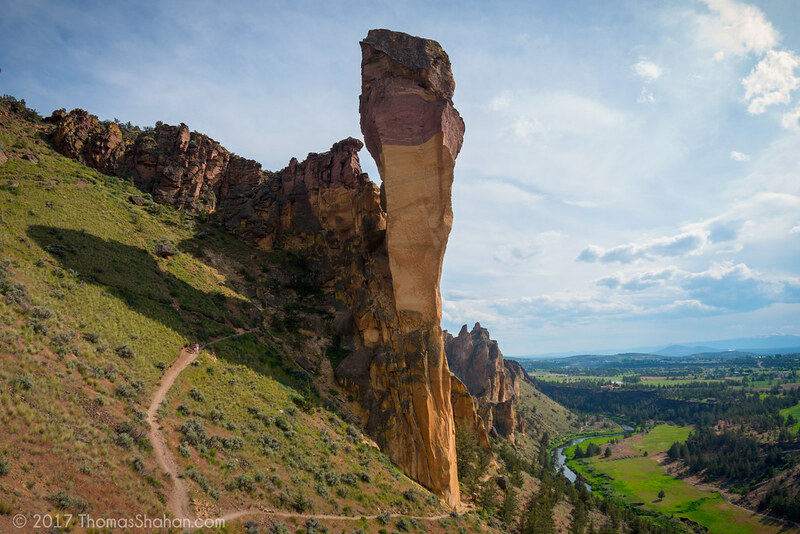 A nice Smith Rock landscape taken by Flickr member scott zarnegar from the Crooked River looking north showing a line of cliffs and Monkey Face in the back. The west face is on the left skyline. A nice shot showing the entire Monkey Face Tower and the entire west face route by Flickr member Jeff Johnson. Three climbers on the west face route on Monkey Face (the route we did). They’ve just finished pitch one and are starting on two. This image was taken by Flickr member scott zarnegar. Flickr member Thomas Shahan shot this unusual view of Monkey Face, looking south. 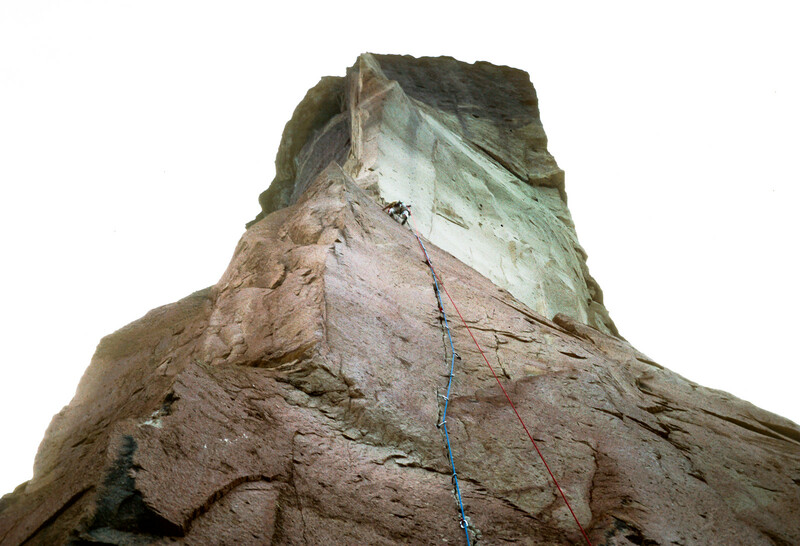 The west face route goes up the right skyline (note the overhang on the top half). 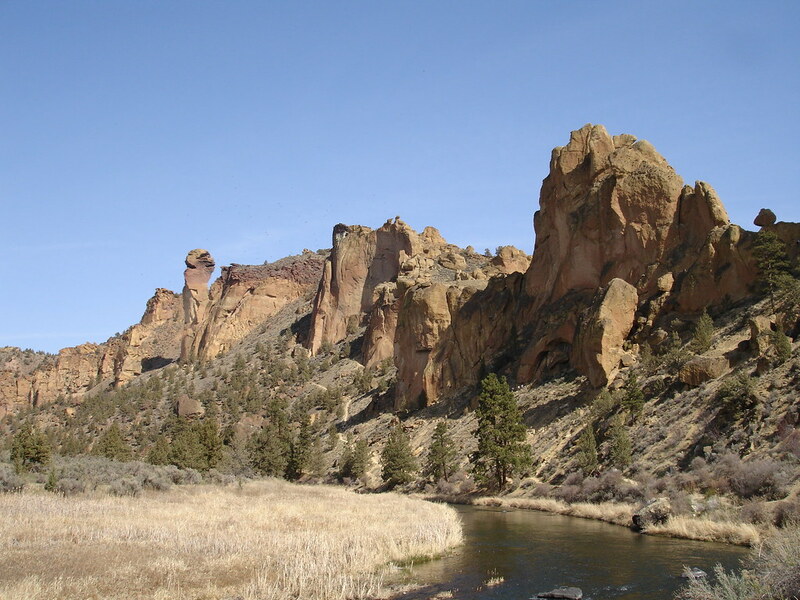 You can see the Crooked River below and the Oregon Cascades in the distance. This is a brilliant shot. 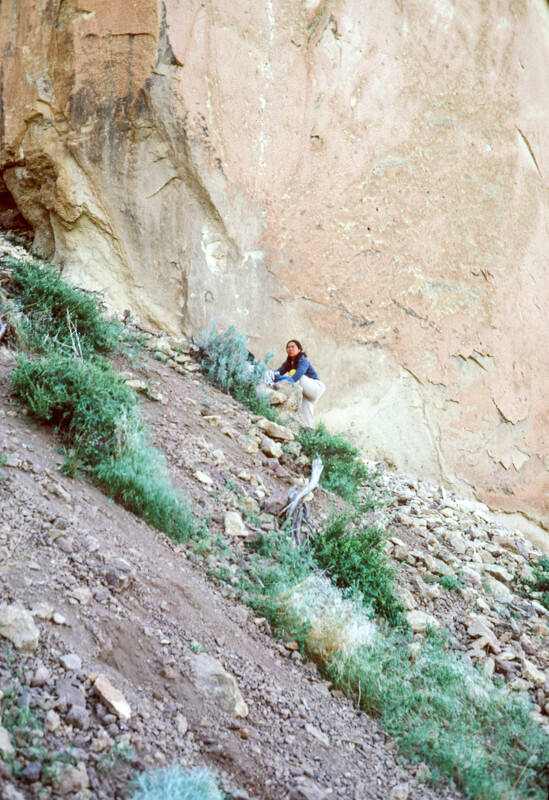 We didn’t actually get to climb the West Face of Monkey Face until May of 1979. Faye and I drove over to Smith Rock Park and spent night one in one of our VW campers in the parking lot. Then we assembled our gear and hiked over Asterisk Pass and north on the Crooked River to the base of Monkey Face. We unloaded and sorted out our gear before the climb. 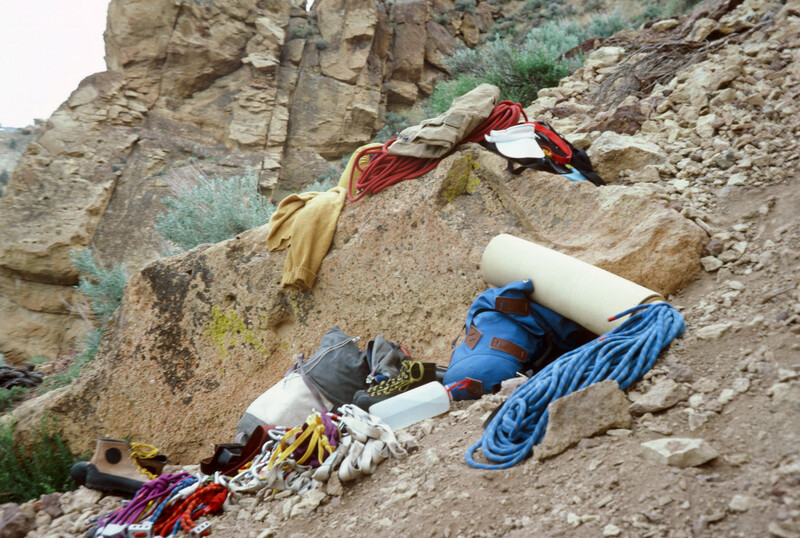 Note the two packs (mine eaten by marmots in Yosemite), foam pads to sleep on in the cave, rack of hexagonal nuts (small protection underneath), slings, a load of carabiners (long aid pitches and sling belays require a lot of them) two ropes, and stiff climbing shoes to make standing in aid stirrups less painful. We had no sleeping bags, we slept in our clothes on the pads. Faye sorting gear at the base of Monkey Face. After we got all the gear sorted and me set up to lead the first pitch, we found a place for Faye to anchor to belay me. We also tied the two packs together and I hauled them when I got to the first ledge as one would a larger pack on a bigger multi-day wall climb in Yosemite (or elsewhere). Remember, we were rehearsing for our future Lost Arrow Tip climb as well as learning and practicing big wall techniques for other longer climbs we planned to do in the future. Faye putting on knee pads. 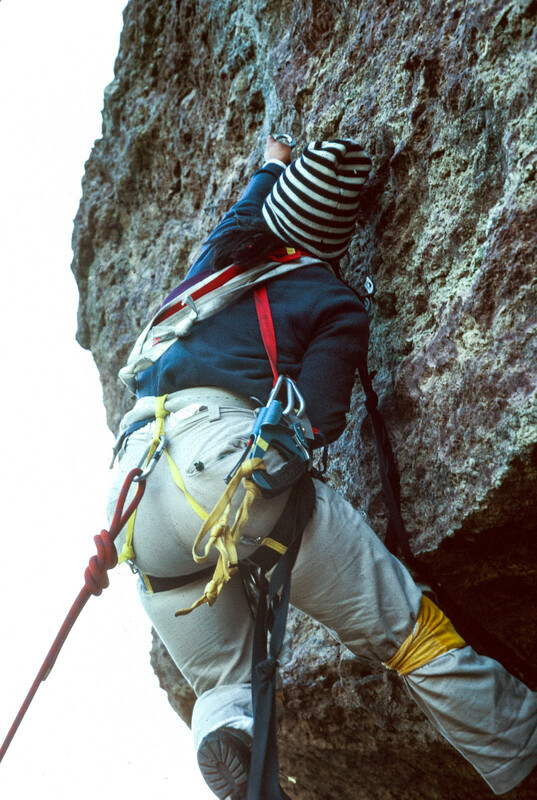 We experimented with knee pads on this climb because aid climbing involves resting with a knee against the rock and the rock at Smith is volcanic “welded tuff” which rips up pants and skin. In the end, we didn’t continue to use the pads as they got in the way on mixed free and aid routes but this route was all aid so we figured they’d be useful. If memory serves, they were. 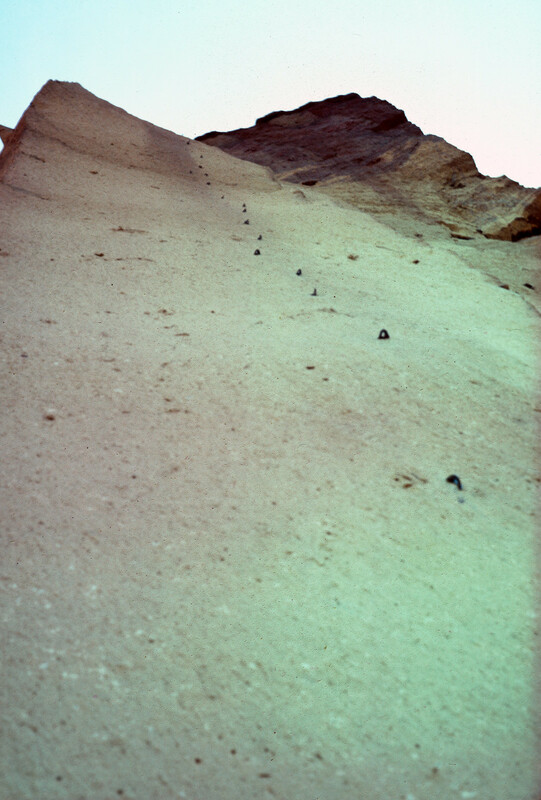 Looking up at the west face route from the ground. I realize that as I write this in 2018 the west face route on Monkey Face is free climbed (5.12b) but the free route does not follow the original aid route. At least at this point, it would be impossible to free the overhanging bolt line on pitch two (the top of the image above). The free route goes to the left (north) a bit and follows the corner. Notice on the image above that the first pitch is mostly a thin crack which can be protected with small stoppers and nuts. There are a few bolts on it but it’s mostly a thin crack. Pitch one ends where the red rock changes to tan. There’s a small ledge there. Richard (me) aid climbing pitch one on the west face of Monkey Face. Note: the blue rope is the lead climbing rope, the red rope is the haul rope and will be used to haul up the packs. Place a piece of protection. More on this here: aid climbing. 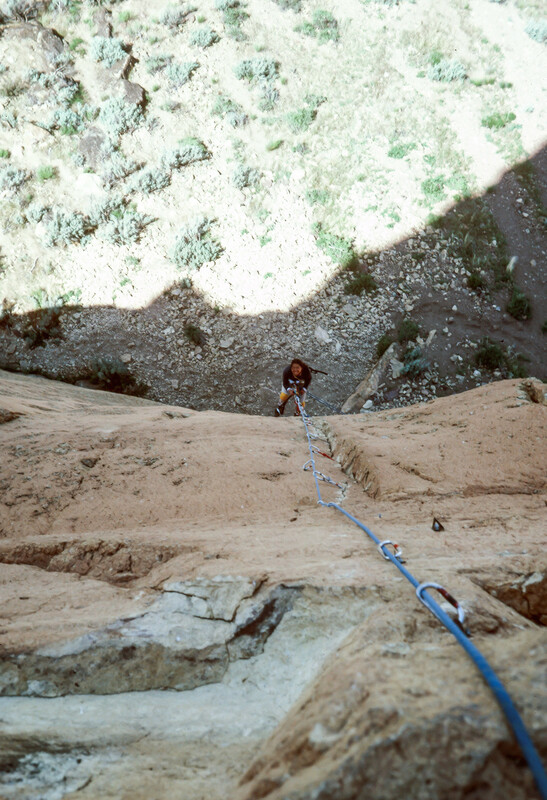 Richard (me) approaching the first belay on the west face of Monkey Face. Because Faye and I were doing this climb in “big wall style” when I reached the small ledge belay at the top of pitch one, I tied off the lead climbing rope (blue) which tied me into the anchor point and also secured the rope so Faye could ascend it with mechanical ascenders and clean the protection out of the pitch without an active belay by me. This allowed me to use the red rope and my two ascenders and a pulley I was carrying to haul the packs up to my ledge. 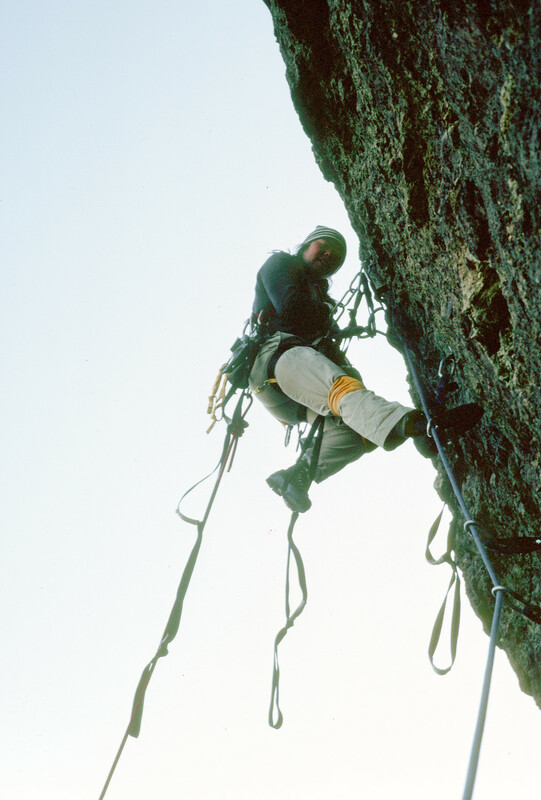 In fact this is how big walls are climbed and this technique, developed by Royal Robbins and others in Yosemite Valley in the 1950’s is still in use today. 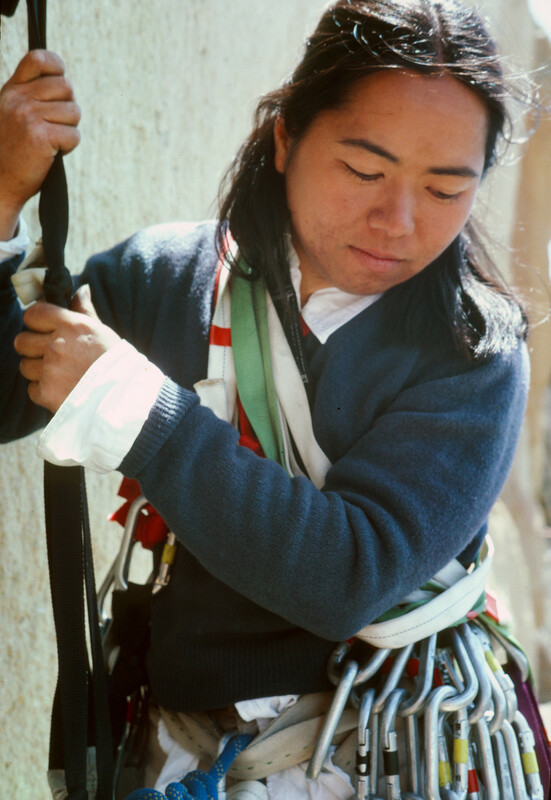 Most of the individual tools have been modernized but the technique remains the same: leader leads on a belay from follower, ties off rope, hauls bag while follower ascends and cleans pitch. Switch places, repeat x times up the wall. When a route is shorter and involves more free climbing (less aid) and less stuff to haul the leader might belay the follower up a pitch so he/she can climb it free. For more on this see Big Wall Climbing. Looking down pitch one from the small belay stance. Faye using ascenders to climb and clean pitch one. Notice that the red rope and packs have already been hauled up. Faye continuing up pitch one. Faye almost done with pitch one. Note: using ascenders like she’s doing here is strenuous although like leading aid, one gets into a rhythm and that involves short rests. Faye finished with pitch one resting at the belay. Notice Fay’s harness in the image above. The style in those days was to wrap a thick, tubular piece of 2″ webbing around your waist 3-4 times and tie it with a water knot (an overhand follow through). Then either take a long sling and make a figure 8 out of it and step through it for leg loops and secure them to the waist webbing with carabiners, or, buy sewn leg loops. We had an industrial sewing machine and made our own leg loops which you can see in later images. They worked well and we used this setup for many more years until pre-made harnesses got more popular and we had more money to buy them. Looking up at the bolt ladder at the start of pitch 2. When there isn’t a crack to bang a piton or slip a nut into, bolts are used to climb blank walls. 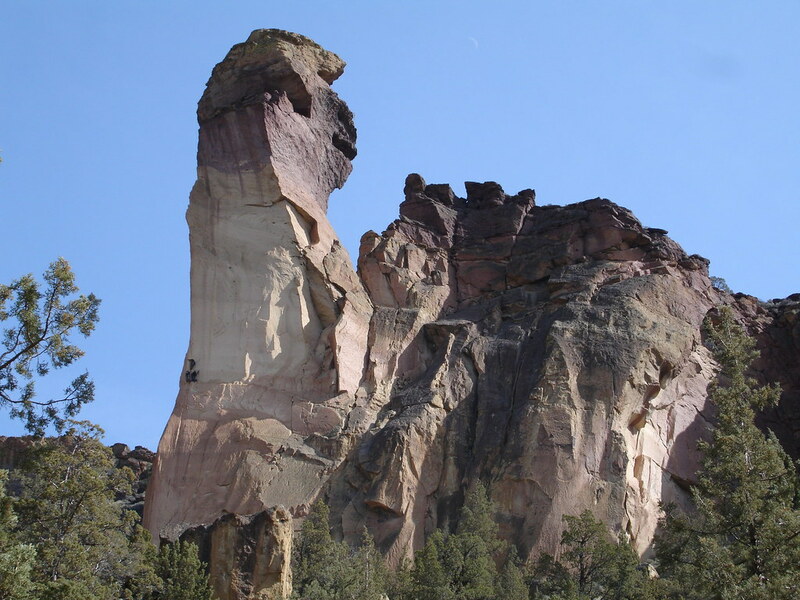 What you have to remember is that the guys who did the first ascent of this stood here and used a hand drill to drill 1/4″ or 3/8″ holes in the rock. These drills were a drill tool that looks like a screwdriver handle with a drill bit on the end and a hardened other end for hitting with a hammer. Place the drill on the rock, hit, twist, hit, twist, hit… repeat dozens of times to make a hole deep enough to put a bolt in. Later with the invention of better batteries folks carried electric drills and extra batteries up walls like this to drill holes for bolts. Once the hole is drilled and cleaned out there are a few different types of bolts that can be put in, depending on the strength of the surrounding rock and what the climber has in his or her pocket. The easiest to place is an expansion stud: a short rod, 1/4″ which with a bulge in the middle and threads on the outer end. You pound it into the hole and the bulge collapses making it tight with the walls of the hole. Alternatively, a sleeve is pounded in with threads on the inside of it and the threaded stud is screwed into it. Each of these techniques leaves a threaded stud sticking out of the rock. Onto this stud one places a bent piece of sheet metal called a “hanger” which has a hole on one face for placing on the stud and a larger hole on the other face for clipping a carabiner to. Once the hanger is in place a nut is threaded onto the stud. Some folks used to put epoxy on both the top of the nut and around the hole to prevent water and ice from getting inside. For more on this, see Hand Drills vs. Power Drills and anchor bolt. So, the idea that the first ascent party put in this ladder of bolts going up (not hanging on a rope coming down which was later popularized in sport climbing here) is amazing. Then think about some of the other big wall climbs with hundreds of bolts on them and you get a bit tired in the arms, back, and neck. I’ve put one bolt in on a climb in my entire life and that was more than enough. 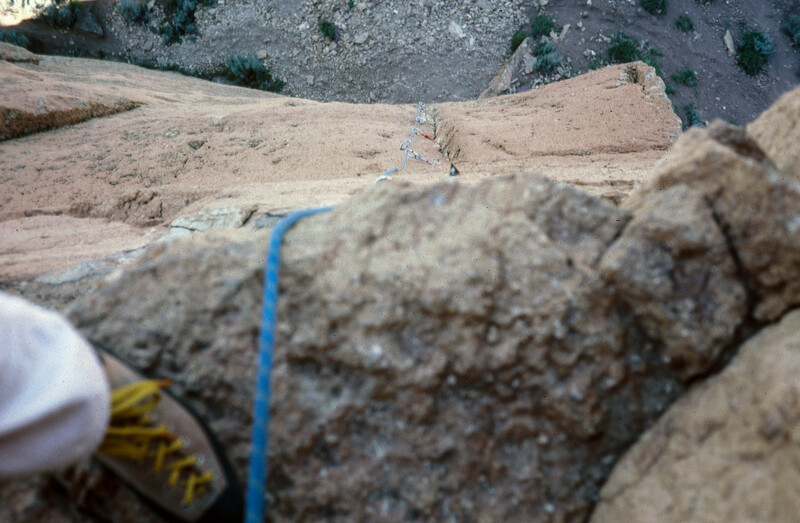 Climbing a bolt ladder, as long as the first ascenders weren’t too much taller than you isn’t all that hard and as memory serves I was able to climb pitch 2 relatively easily although I’m only 5′ 6″ so no doubt some of the reaches were long for me. The cave at the back of the monkey’s head at the top of pitch 2 on the west face route. After finishing pitch 2 I entered the cave at the back of the monkey’s head. I anchored the lead rope so Faye could clean the pitch and I hauled our bags up. The last bit was tough as I remember as it was over a rough edge. Faye assembling rocks for our campsite in the cave. Note the long shadows as the sun goes down and it gets colder. Faye and I had been on top of Monkey Face numerous times on other climbs but we’d never been in this cave and we weren’t sure what we’d find there. 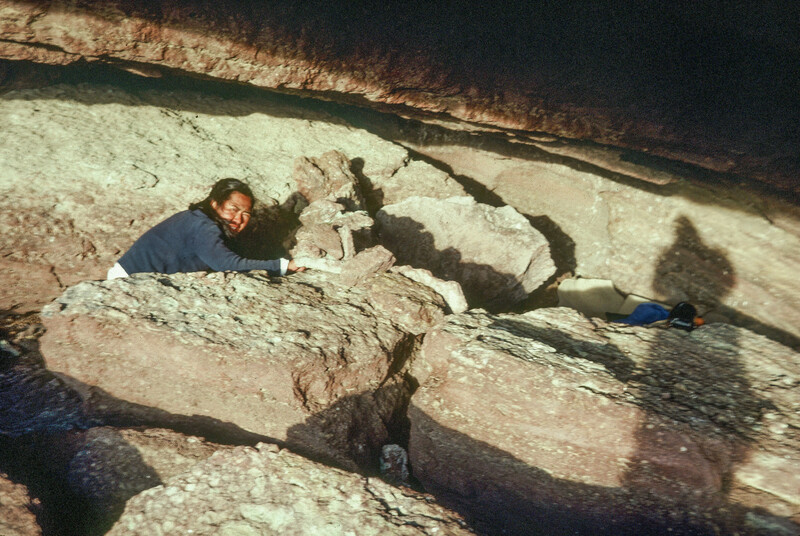 Maybe mice, bats, or some other beast was living there and we were prepared to keep going and sleep on top if we had to but in fact, the cave, while rough, wasn’t too bad and we were able to find enough loose rock to build a wind break. We just had some extra clothes and foam pads so it was going to be a less than fully comfortable night but hey, when you’re young you can do stuff like that. 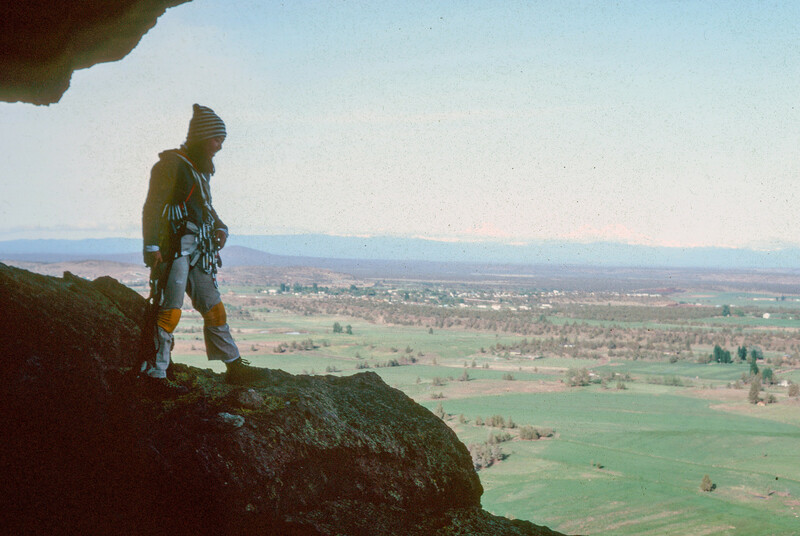 Looking west out of the cave toward the Cascades. 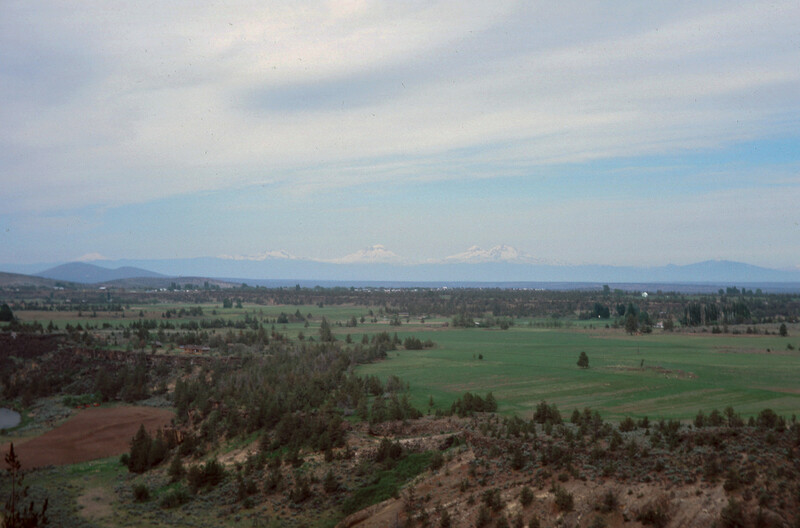 Three Sisters (mountains) on horizon. Faye geared up to lead the last pitch out of the cave and around the back top of the head. Note: Faye was a very strong climber. I was the one who got us into climbing in the first place and mostly drove our interest in it, but she could do most anything I could do, including leading the toughest pitches we did at the time. We didn’t compete with one another, if I didn’t want to lead something she almost always did it which is exactly the kind of climbing partner you want to have. We got along much better as climbing partners than we did as a couple. Faye leading out of the cave at the back of the monkey’s face, pitch three. Even though the last pitch was mostly bolted, it started out on an extreme overhang and the roof was tall enough so that as I remember it, we had to pile some rocks up for Faye to reach the first one. 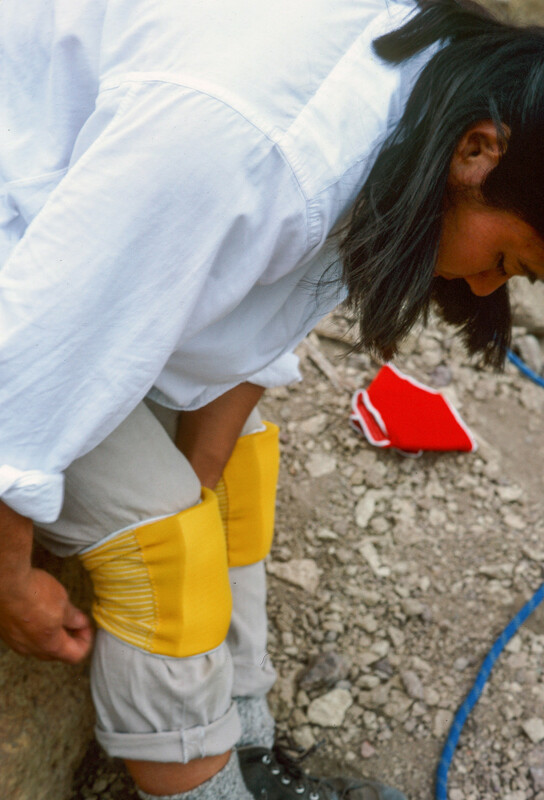 In the image above you can see her wearing our home-made leg loops, she’s got her two blue ascenders on a sling and her left knee pad is earning its keep on the rough rock. Behind her is 380 feet of air to the ground. She’s reaching up to clip into the next bolt. Faye leading out of the cave at the back of the monkey’s face, pitch three. Note the hang of the ropes and overhang. My image is not very level, the overhang is more severe than it looks here. Faye leading out of the cave at the back of the monkey’s face, pitch three. Note the hang of the ropes and overhang. She’s putting extra slings on the protection because the rope drag over the back of the head is horrendous. Faye leading out of the cave at the back of the monkey’s face, pitch three. She’s resting, clipped into the anchor and catching her breath. The overhang makes this pitch tough. Good thing it’s not all that long. The image above is the last one of us on this climb. Needless to say, we got to the top and did the notorious free rappel off the monkey’s nose. 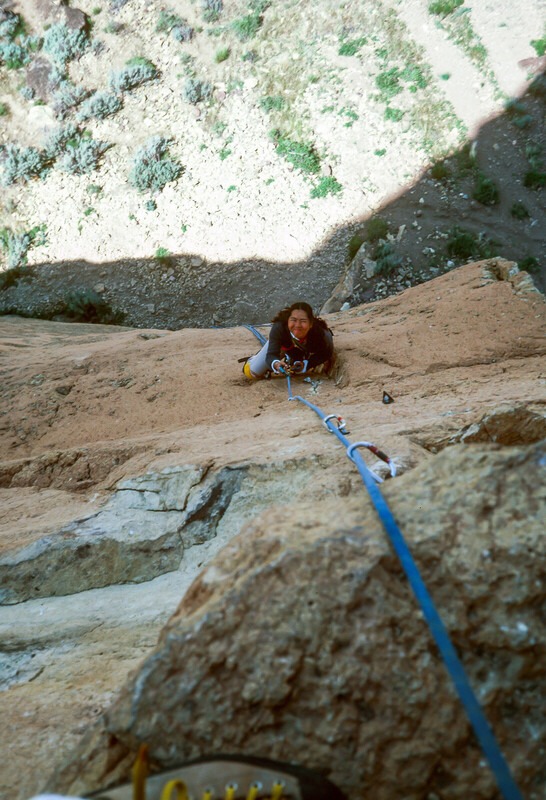 Here’s a more recent shot of that free rappel by Flickr member Dan I. This is looking at the east face of the tower (the west face climb is on the other side). 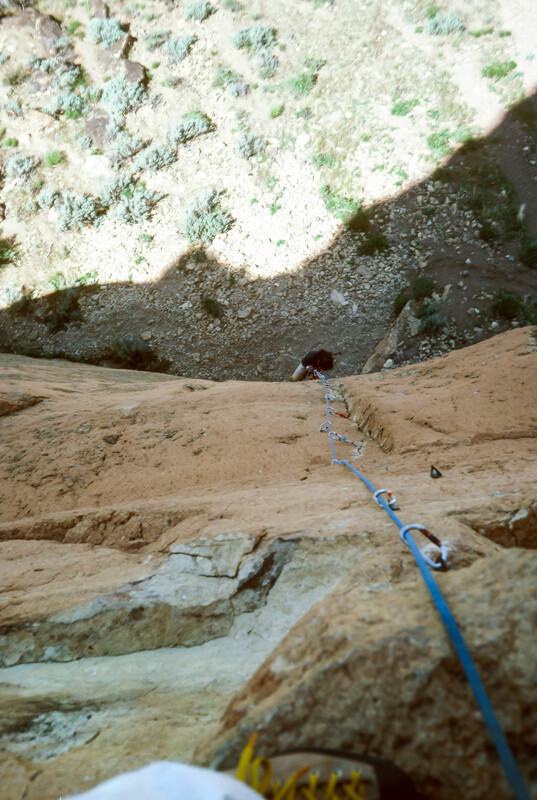 The rappel ends in the notch between Monkey Face and the main wall. Note: the east face of Monkey face has been free climbed. Amazing. 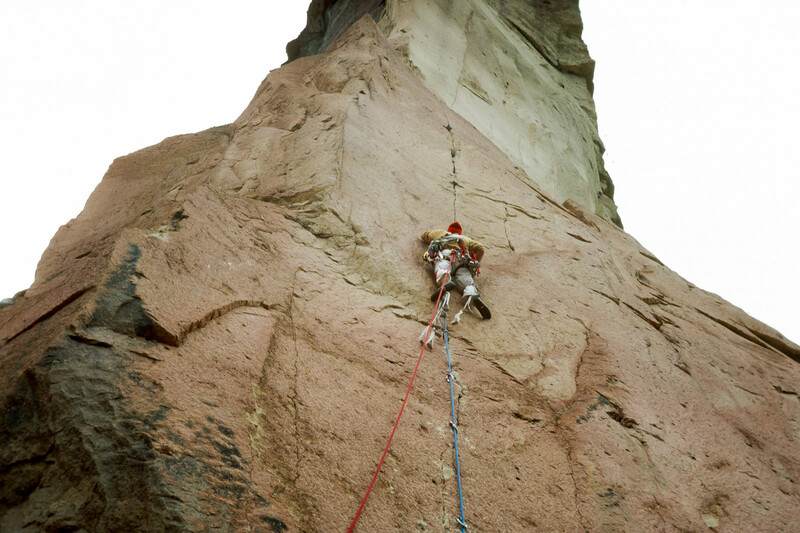 I did the north face (right in this image) of Monkey Face a few years later with another climbing partner. After finishing the rappel we packed up our gear and hiked back out to our VW van for the trip home. It was a great climb, well within our abilities and while the Lost Arrow Tip in Yosemite was going to be tougher in many respects, we both felt like this climb helped prepare us for it. Rope handling (fast and safe technique with the gear) on climbs like these is almost as important as climbing ability and both of us felt we learned a lot on this climb. 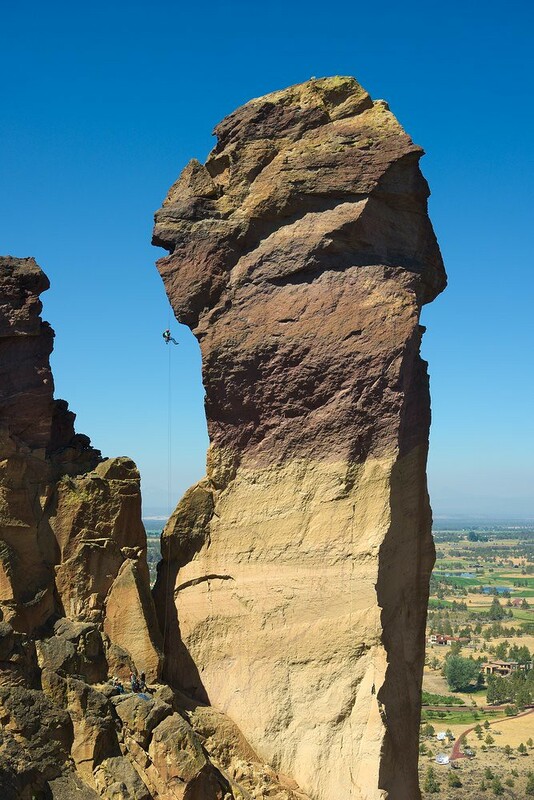 We weren’t going to return to Yosemite until the following summer so we had plenty of time to continue practicing which we did, both at Smith Rock and at other Oregon climbing areas. Next installment, climbing the Lost Arrow Spire in Yosemite Valley. 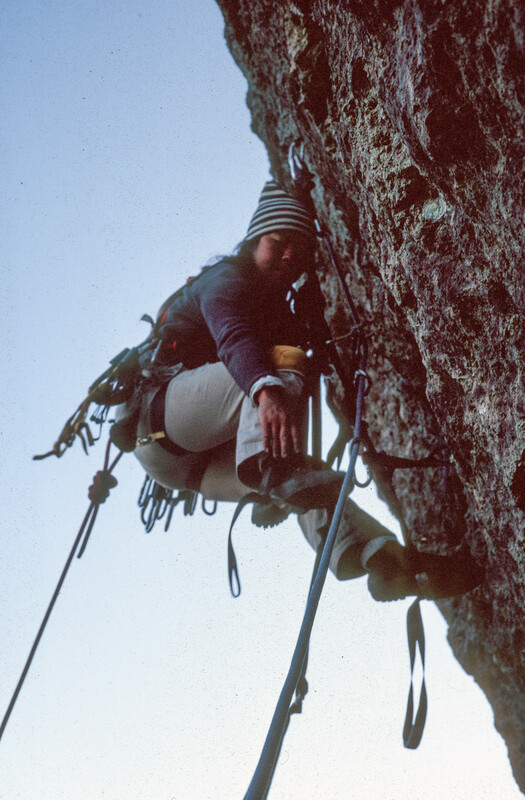 What a great post about the intense training you and Faye did before climbing the Lost Arrow Spire in Yosemite. The photos were fascinating, glad you saved and edited them for your article. 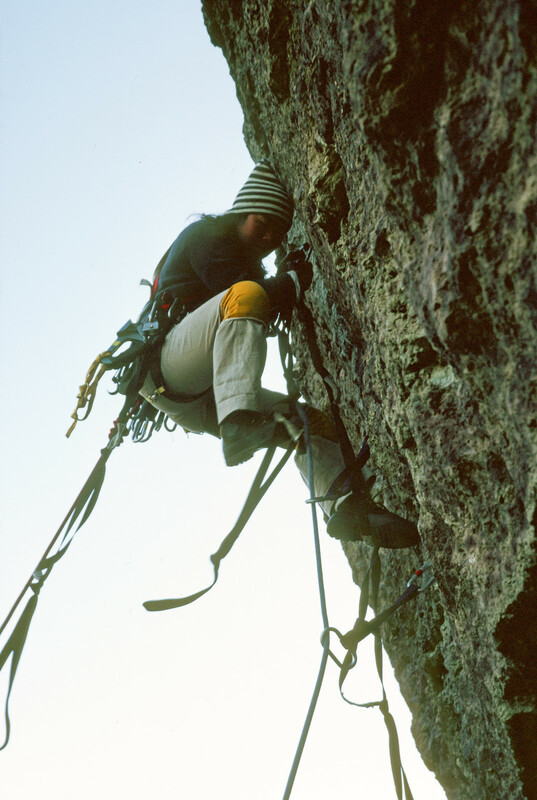 Your excellent account and the photos are a superb glimpse into your past as a very hard working and talented rock climber. Great story well told! I learned a lot I didn’t know about climbing and some more about Richard (Faye too) Thanks. Thanks Allan. You certainly knew us both while this was going on. No doubt people wondered why we’d skip out of the studio to head down to the columns on nice afternoons. Great photos with incredible written details Richard. Super cool that you have the photos. I’ll be taking a short trip to Bend area soon and may take Monkey Face in from a hiker’s perspective then. Great Sandy. I’ve not been back there in a very long time. No doubt it’s much more developed now as Bend has become popular and the Park has too.